Shipton at Bruern Holiday Cottages in Bruern, near Chipping Norton sleeps 6 people. Bruern Holiday Cottages near Chipping Norton are set in the heart of the Cotswolds, between Chipping Norton, Stow-on-the-Wold and Burford; Bruern Holiday Cottages offer the comfort and attention to detail of a good hotel, combined with the privacy, independence and space of home, amidst the civilised ease and style of English country house living. Even though the properties (refs UKC1147, UKC1145 [Cope], UKC1146 [Newmarket], UKC1148 [Bookers], UKC1149 [Weir House], UKC1150 [Aintree], UKC1151 [Epsom], UKC1152 [Goodwood], UKC1153 [Wychwood], UKC1154 [Sandown]) are self-catering, generous welcome packs are provided, as well as a few little luxuries including champagne, homemade cakes and local artisan cheese. A paradise for children, there are three playgrounds, a play cabin, toy cars and many more facilities to entertain all ages, including a games room. Featured in Tatler’s ‘101 Best Spas’, the facilities on-site provide the perfect setting to relax in, with an indoor heated swimming pool, complete with patio doors opening onto a beautiful Italianate garden, with sun loungers on the terrace. Those eager to keep fit can take advantage of the gym, which includes a running machine, power plate, exercise balls, rowing machine, cross trainer, weights and an exercise bike. Those less keen can relax at the spa and have a treatment (at cost, by arrangement with owner). Shipton Cottage has been converted from a long, low Cotswold stone barn and is all on one level. It has a seaside feel to it, pale, cool and full of light. When you enter from the drive to the big open-plan drawing room/dining room/kitchen, you can see straight through the French doors and windows to the terrace and apple orchard beyond. The atmosphere is very much of the present, with natural floors in stone and wood, a high pitched ceiling with ancient beams, and a cool simplicity of decoration. 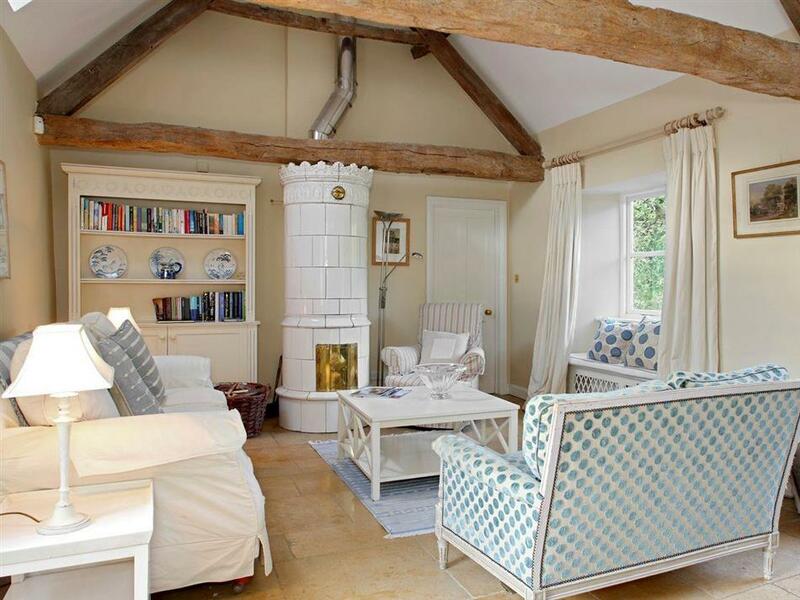 The focal point of the room is a white ceramic Scandinavian wood burner, Gustavian in inspiration. Over the blue and white dining table, painted by Thomas Lane in a moorish design, hangs a Victorian rise and fall brass pendant lamp. Contemporary paintings and prints fill the walls. At the other end of the drawing room, a door leads into the master bedroom, which has a high pitched roof and walls of pale grey. The floor is pale and polished, and the antique French black metal four-poster is a large cream painted French armoire. Doors lead out from both master bedroom and drawing room to the terrace and the orchard. Round the gnarled and ancient apple trees in the velvety green grass are deep borders of roses, peonies, lilies and poppies, over which can be seen the roofs of Bruern Abbey. Property references UKC1144 to UKC1155 can be booked together to accommodate larger groups. The shop is 1½ miles, with the pub and restaurant 3 miles from Bruern Holiday Cottages near Chipping Norton. Shipton is all on the ground floor. Open plan living space: With beams and French doors leading to terrace and apple orchard. Bedroom 1: With four poster king-size bed, door leading to terrace, and en-suite with power shower over bath, and toilet. Bedroom 2: With twin beds and en-suite with shower cubicle, toilet and slate floor. Bedroom 3: With four poster twin beds, beams and en-suite with shower cubicle, toilet and tiled floor. Oil central heating, electricity, bed linen, towels and Wi-Fi included. Initial logs for wood burner included. Travel cot, highchair and stairgate available on request. Welcome pack. Games room with pool table, table tennis and table football (shared). Enclosed garden with terrace, apple orchard and garden furniture. Bikes of all sizes available by arrangement direct with owner. Children’s play areas (shared). Indoor heated swimming pool with changing facilities (shared). Well-equipped gym (shared). Residents car park (not allocated). No smoking. VisitEngland Gold Award. Pets allowed at Bruern Holiday Cottages - Shipton. For a better idea of where Bruern Holiday Cottages - Shipton is, you can see Bruern Holiday Cottages - Shipton on the map below. 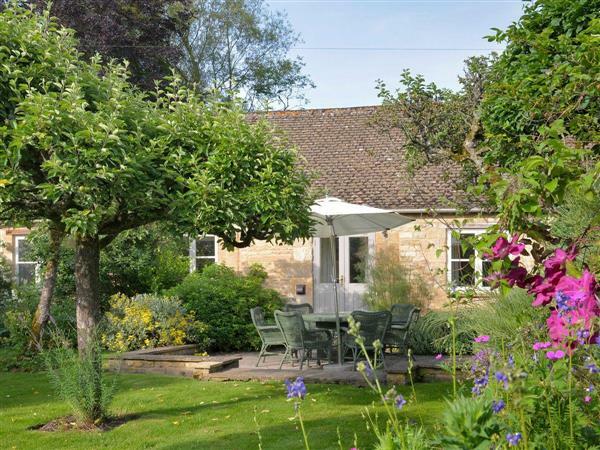 Bruern Holiday Cottages - Shipton is in Oxfordshire; should you be on the lookout for a special offer, you can find all the special offers in Oxfordshire. It's always worth checking to see what is on offer at the moment. Do you want to holiday near Bruern Holiday Cottages - Shipton (UKC1147), you can see other cottages within 25 miles of Bruern Holiday Cottages - Shipton; have a look to find your perfect holiday location.